Help Wujeeta cure her skooma addiction. Talk to Wujeeta about her job. Give her a healing potion. If you walk near Wujeeta, she will cry about losing her job and beg for help. 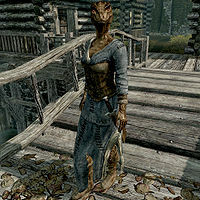 Talk to her, and she will reveal that she has an addiction to skooma and that she wants to cure herself. She will ask for a healing potion in order to heal herself. If you probe further she will mention where she got the skooma from, "I got mine off of a merchant ship in Solitude", which ties in with another quest. You have three options: agree to give her a potion, agree to find one for her, or refuse to help. If you refuse to give her a potion, the option remains to agree to give her one. If you agree to give her a potion, the lowest type of standard healing potion (eg. Potion of Minor Healing) in your inventory will be removed, and she will reward you with a leveled unenchanted ring while thanking you, "Your kindness will never be forgotten". Dialogue is closed at this point and the first part of the next quest is immediately added to the miscellaneous quests. Healing spells do not work and she does not recognize crafted healing potions. She can only take a standard healing potion. This is the first of three quests that are required to unlock the option to become Thane of the Rift for Laila Law-Giver. There are additional requirements noted on that quest's page. Wujeeta is not essential, and if she dies before this quest and the next are complete, you cannot become Thane of the Rift unless the Imperials take control of the Rift, either through negotiation or force. A workaround of this problem using console would involve writing in sequence (without quotes): "prid 19ddf" then "moveto player". Then, in console select Wujeeta's body and write: "resurrect". Finally, write "setstage freeformriften12 20". This will reset Wujeeta to the point where you need to give her a healing potion and the quest can continue from there. Although Wujeeta isn't the owner of the Riften Fishery, raising her disposition with this quest will allow you to freely take items from the fish barrels inside the fishery and around the nearby fishing boats. On the PC, it is possible to use the console to advance through the quest by entering setstage FreeformRiften12 stage, where stage is the number of the stage you wish to complete. It is not possible to un-complete (i.e. go back) quest stages, but it is possible to clear all stages of the quest using resetquest FreeformRiften12. This page was last modified on 24 September 2015, at 20:46.